No reusability of the SMTP connection When calling the function to send an email, the function sends the email immediately, creating a new SMTP connection on that moment (it doesn’t offer to collect all emails and send them all together at the end of the request, under a single SMTP connection). Finally, we upload the emails to S3. We decide how many emails to upload per file with the intention to save money. Lambda functions charge based on the amount of time they need to execute, calculated on spans of 100ms. The more time a function requires, the more expensive it becomes. Sending all emails by uploading 1 file per email, then, is more expensive than uploading 1 file per many emails, since the overhead from executing the function is computed once per email, instead of only once for many emails, and also because sending many emails together fills the 100ms spans more thoroughly. So we upload many emails per file. How many emails? Lambda functions have a maximum execution time (3 seconds by default), and if the operation fails, it will keep retrying from the beginning, not from where it failed. So, if the file contains 100 emails, and Lambda manages to send 50 emails before the max time is up, then it fails and it retries executing the operation again, sending the first 50 emails once again. To avoid this, we must choose a number of emails per file that we are confident is enough to process before the max time is up. In our situation, we could choose to send 25 emails per file. The number of emails depends on the application (bigger emails will take longer to be sent, and the time to send an email will depend on the infrastructure), so we should do some testing to come up with the right number. For simplicity, in the code above, I am not uploading the attachments to S3. 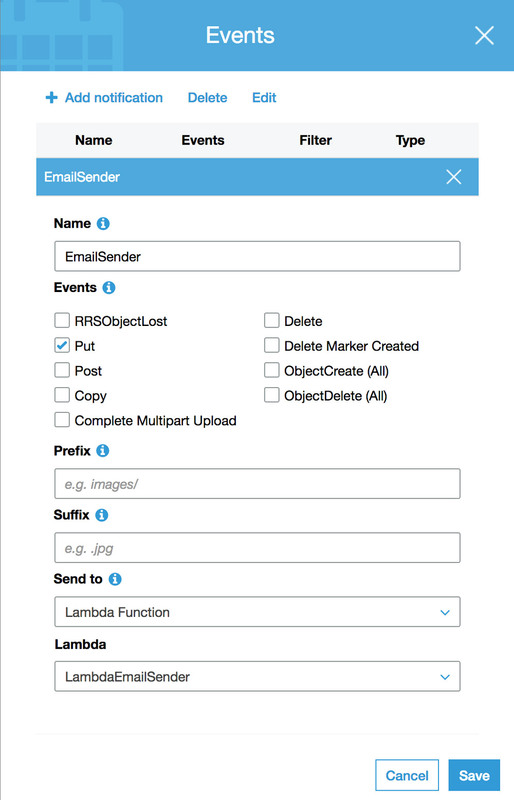 If our emails need to include attachments, then we must use SES function SendRawEmail instead of SendEmail (which is used in the Lambda script below). 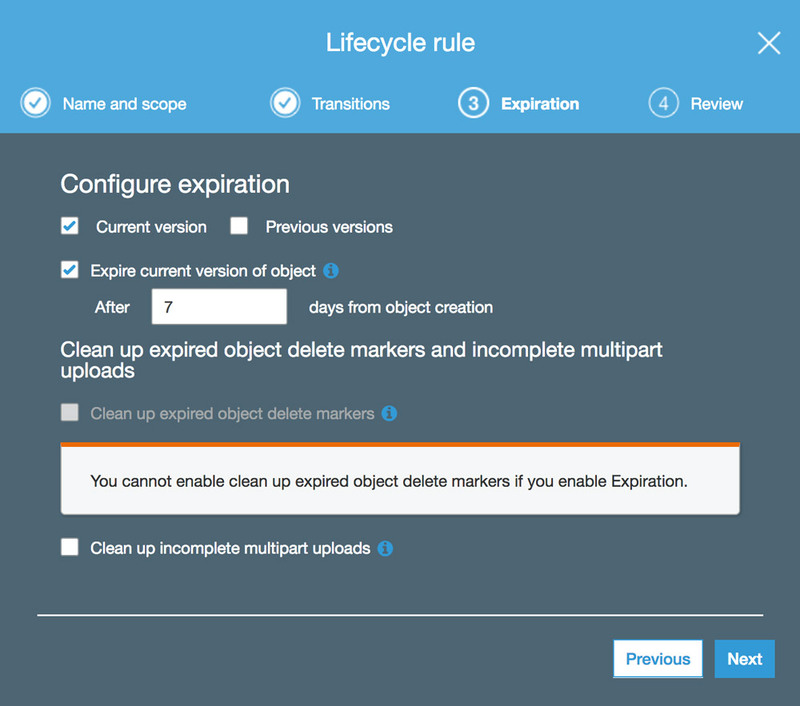 Having added the logic to upload the files with emails to S3, we can move next to coding the Lambda function. Lambda functions are also called serverless functions, not because they do not run on a server, but because the developer does not need to worry about the server: the developer simply provides the script, and the cloud takes care of provisioning the server, deploying and running the script. Hence, as mentioned earlier, Lambda functions are charged based on function execution time. Obtains the new object’s path (under variable srcKey) and bucket (under variable srcBucket). Downloads the object, through s3.getObject. Parses the content of the object, through JSON.parse(response.Body.toString()), and extracts the emails and the email meta. Iterates through all the emails, and sends them through ses.sendEmail. 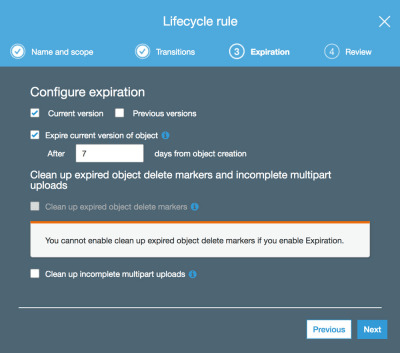 Creating an execution role granting Lambda permissions to access S3. Creating a .zip package containing all the code, i.e. the Lambda function we are creating + all the required Node.js modules. Uploading this package to AWS using a CLI tool. How to do these things is properly explained on the AWS site, on the Tutorial on Using AWS Lambda with Amazon S3. Lambda: name of our newly created Lambda, eg: “LambdaEmailSender”. That’s it. From this moment, when adding a new object on the S3 bucket with the content and meta for the emails, it will trigger the Lambda function, which will read the file and connect to SES to send the emails. I implemented this solution on my site, and it became fast once again: by offloading sending emails to an external process, whether the applications send 20 or 5000 emails doesn’t make a difference, the response to the user who triggered the action will be immediate. In this article we have analyzed why sending many transactional emails in a single request may become a bottleneck in the application, and created a solution to deal with the issue: instead of connecting to the SMTP server from within the application (synchronously), we can send the emails from an external function, asynchronously, based on a stack of AWS S3 + Lambda + SES. By sending emails asynchronously, the application can manage to send thousands of emails, yet the response to the user who triggered the action will not be affected. However, to ensure that the user is not waiting for the email to arrive in the inbox, we also decided to split emails into two groups, priority and non-priority, and send only the non-priority emails asynchronously. We provided an implementation for WordPress, which is rather hacky due to the limitations of function wp_mail for sending emails. A lesson from this article is that serverless functionalities on a server-based application work pretty well: sites running on a CMS like WordPress can improve their performance by implementing only specific features on the cloud, and avoid a great deal of complexity that comes from migrating highly dynamic sites to a fully serverless architecture.